Finally, an art print that you will love to show off to your family and friends! These are the most intricate map prints around. I started with detailed watershed datasets and wrote a custom computer program to chart the locations of every river, stream, and lake. 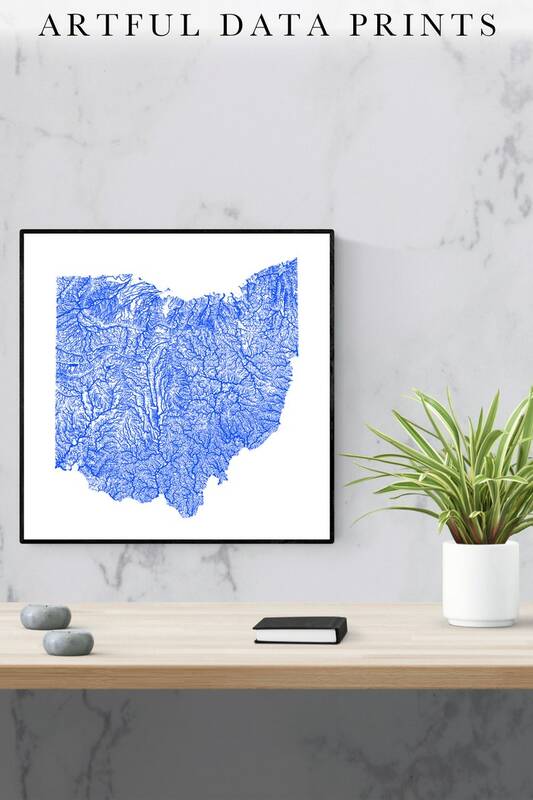 Then, I designed this elegant Ohio map print to look just as good from a distance as it does up close. Seriously, I've tested this map art print to be as stunning on your desk as it is blown up on your wall. Need I say more? I can’t help it! I use museum-quality ink and heavy matte paper, so my map art prints won’t discolor, fade, or wear out with time. People LOVE exploring my maps with their family and friends. I hear from customers all the time who tell me how they love showing off these maps, taking turns finding their homes, local landmarks, and geographic features. There’s always something new to explore! It’s easy to get your own map print right now. Choose your size in the drop-down menu. Add to cart and proceed to checkout. You'll get your map in 6-10 days. I’m also going to send you a quick message once you get it to make sure your expectations have been exceeded in every way!